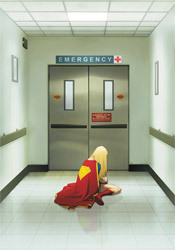 Since returning to modern continuity, Supergirl hasn't exactly made a lot of non-costumed friends. In fact, she could count on two fingers the number of close acquaintances she knows who don't don a cape, cowl or other spandex-wrapped wardrobe once the sun drops below the horizon. As fate would have it, both are in need of her aid this month – one faced with the onslaught of a crazed Silver Banshee, and the other facing something... darker. This month's fill-in as artist, Matt Camp, hands in an oddly inconsistent showing. At his best, Camp's style is beautiful in its simplicity. When Lana Lang collapses in a pool of her own blood early in the issue, Camp's stark, matter-of-fact depiction is staggering. I was every bit as shocked and terrified as the doorman who finds her there, struggling for life on the floor. On the very next page, however, it's like the artwork has been handed over to a completely different contributor. Camp's two-page treatment of the scream-off between a possessed Supergirl and the Silver Banshee looks like an afterthought, something that was rushed out the door in no time flat. All of the intricacies that had made the previous page's layout so striking have suddenly gone missing. The double-sized impact shot pales in comparison to the more conservative single page, four panel masterpiece. That duality carries throughout the whole issue. Some pages, it seems like Camp couldn't care less. Others, he makes an argument for himself as one of the publisher's brightest emerging artists. His struggles are both complimented and compounded by the work of Nei Ruffino, his colorist. In certain instances, Ruffino's heavy influence emboldens the artwork – the scene featuring Lana being a perfect example. It's rich and vibrant, but not in a way that steals any of the spotlight from the panel's composition. In others, an unrelenting flood of excess color overwhelms the cleanliness of the page. Neither artist nor colorist really seems to know precisely what they're doing at any given moment, which makes Supergirl's artwork a real hit-or-miss proposition. Sterling Gates does his best to write the issue as a character piece, especially after the battle with the Banshee is behind him, but I never found myself personally invested. While the issue's cover gives the impression that the story would be extremely heavy and emotionally draining, its interiors never get close to that target. Lana "dies," – which I'll place in quotes because, let's be honest, that word doesn't mean what it used to – and Supergirl's reaction seems much more like a non-reaction. She's barely let the moment sink in before she's asking questions about her friend's bloodstream and grimly planning to see the body. This doesn't come off as a part of the mourning process, or even something emotional. It just seems like a character trying to turn the page and get on with the next scene so they don't have to force out any crocodile tears. Gates's story climaxes on page three and then goes on vacation. There's really no reason to read this issue beyond those first three pages. They're the strongest of the book, misleading its audience into believing the rest of the issue can keep it up when, in fact, nothing could be further from the truth. It's a breakneck kick start followed by a slow coast down the rest of the highway. Flip through it and try not to let anybody see you put it back on the shelf when you're finished. I completely disagree with your rating of this issue. I felt very compelled and emotionally invested with this comic. I felt it to be one Sterling Gates better pieces of literature in Supergirl. Maybe it's something better judged by long-term readers, then. I thought the premise was ripe for a solid character-driven story, but the plot and dialog never came close to delivering on it. Plus, the showdown with the Silver Banshee came off as terribly generic and dull.